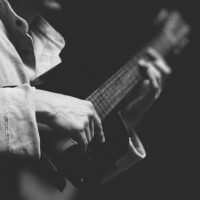 As an intermediate acoustic guitarist in London, you may be strumming some of the songs you like and using some basic hand positions. But are you really getting better as a guitarist? The beauty of acoustic guitar dates back to ancient times and is now the beloved instrument of millions of musicians just like yourself – including intermediate players who went on to become advanced and even professional level entertainers. Stefan Joubert is the founder of the London Guitar Institute and is a master teacher. He has studied under some of the great guitarists. He knows that learning acoustic guitar is both challenging and exciting and he shares his music appreciation with you. The London Guitar Institute has been working with intermediate acoustic guitarists just like you in providing high-quality acoustic guitar lessons in central London (Mayfair and the City), and it allows its students to progress at their own individual rates. The London Guitar Institute for intermediate acoustic guitarists is the best place to learn the style of acoustic guitar you prefer. If you are unfamiliar with the rich variety of styles, Stefan will introduce you to them. You can learn about acoustic funk, New Orleans style, Celtic rhythm guitar, and bluegrass. Learn to play classic acoustic songs like Bob Dylan’s Hurricane or the Eagles’ Take It Easy. Try Wonderwall by Oasis or Sitting on the Dock of the Bay by Otis Redding and Steve Cropper. Find your own groove under the direction of master guitarist Stefan Joubert who has helped so many intermediate acoustic guitarists just like you. If you want to improve your skills with acoustic guitar, you need a good musical foundation and a good path to grow your skills. The London Guitar Institute provides intermediate acoustic guitar lessons that take you from where you are now to where you want to be. What are some of the things you will learn as an intermediate acoustic guitarist in London? You will learn how to improve your strumming patterns by separating and linking bass notes of the chords. You will learn muting techniques and add style by using ornamentation and embellishment. You will learn soloing patterns, tuning with harmonics, and suspended chords. You will learn Flatpicking arpeggios, bending strings, and vibrato and so much more. Stefan Joubert works with intermediate acoustic guitarists in London to review and master their current skills. He makes sure they have the needed confidence before they move on to more complex theories and levels of performance. 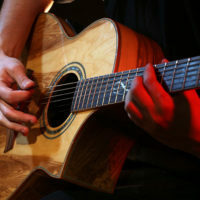 There are two great and convenient locations for intermediate acoustic guitarists in London. As an intermediate acoustic guitarist, you are immediately eligible for training at the London Guitar Institute. There are no pre-requirements. Lessons take place weekly at set times and days. No matter what your level of knowledge or performance on acoustic guitar, Stefan Joubert will help you improve. We look forward to working with you to continue your journey. Become a proud member of the London Guitar Institute, and we will help you become the acoustic guitarist you want to be. Contact us for more info about our intermediate acoustic guitar lessons. We promise a prompt and personal reply within 1-2 working days. As a beginner looking to learn how to play the acoustic guitar, you need solid training and excellent foundations. At the London Guitar Institute, you will learn all the essential elements of strumming, forming chords and playing the songs that you love! How would you feel if you can play everything that you’ve always wanted to play on your acoustic guitar? Take your acoustic guitar playing to the highest level with the London Guitar Institute in central London and reach for the stars! 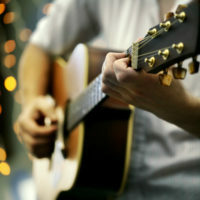 Learn acoustic guitar in a one-to-one or group format in central London. Start your course today and become the acoustic guitarist that you have always wanted to become!